A: Diborane features unusual bonding. 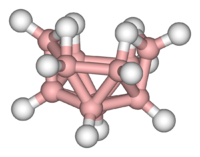 B: Caesium chloride has an archetypal crystal structure. 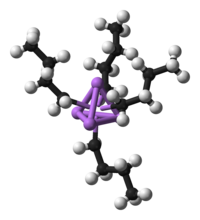 C: Fp2 is an organometallic complex. D: Silicone's uses range from breast implants to Silly Putty. E: Grubbs' catalyst, which led to the 2005 Nobel Prize in Chemistry for Robert H. Grubbs, its discoverer. F: Zeolites find extensive use as molecular sieves. G: Copper(II) acetate surprised theoreticians with its diamagnetism. Inorganic chemistry is the branch of chemistry concerned with investigation of the properties of all elements, and the properties and methods of syntheses of their compounds, except for carbon and most carbon-containing compounds. (The study of some carbon-containing compounds—such as carbon dioxide, carbonates, and cyanides—is considered part of inorganic chemistry.) This field stands in a complementary relationship to organic chemistry, which covers the myriad carbon-based compounds. These two disciplines are generally considered separately, but there is much overlap, such as in the sub-discipline of organometallic chemistry. Important classes of inorganic compounds include the oxides, sulfides, sulfates, carbonates, nitrates, and halides. Many of them are found in inanimate materials, such as minerals. For example, soil may contain iron sulfide as pyrite or calcium sulfate as gypsum. A number of inorganic compounds are found in biological systems, such as in the form of electrolytes (sodium chloride). The study of inorganic chemistry has led to enormous benefits in practical terms. Traditionally, the scale of a nation's economy could be evaluated by its productivity of sulfuric acid. In 2005, the top 20 inorganic chemicals manufactured in Canada, China, Europe, Japan, and the United States were (in alphabetical order): Aluminum sulfate, ammonia, ammonium nitrate, ammonium sulfate, carbon black, chlorine, hydrochloric acid, hydrogen, hydrogen peroxide, nitric acid, nitrogen, oxygen, phosphoric acid, sodium carbonate, sodium chlorate, sodium hydroxide, sodium silicate, sodium sulfate, sulfuric acid, and titanium dioxide. 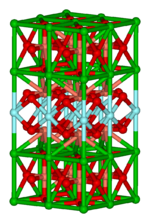 The structure of the ionic framework in potassium oxide (K2O). 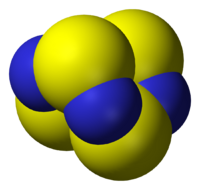 Most inorganic compounds occur as salts, in which cations and anions are held together by ionic bonds. Examples of cations are sodium (Na+) and magnesium (Mg2+); examples of anions are oxide (O2−) and chloride (Cl−). These ions form compounds such as sodium oxide (Na2O) or magnesium chloride (MgCl2), which are neutral in their overall charge. The ions are described by their oxidation state and their ease of formation can be inferred from the ionization potential (for cations) or from the electron affinity (for anions) of the parent elements. Many inorganic compounds are characterized by high melting points. 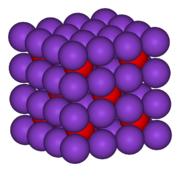 Inorganic salts typically are poor conductors in the solid state. Other characteristic properties of inorganic compounds are their solubility in water (and other solvents) and ease of crystallization. Some compounds (such as sodium chloride, NaCl) are very soluble in water, others (such as silicon dioxide, SiO2) are not. A simple inorganic reaction is double displacement, in which the ions of two salts are swapped without a change in oxidation state. In redox reactions, the oxidation state of one reactant, the oxidant, decreases, and that of the other reactant, the reductant, increases. The net result is an exchange of electrons. Electron exchange can occur indirectly as well, such as in electrical batteries—a key feature in electrochemistry. Some inorganic compounds are acids or bases, and they undergo acid-base reactions. By the Brønsted-Lowry definition, an acid is a proton (hydrogen ion) donor; a base is a proton acceptor. By the Lewis definition, which is more general, any chemical species capable of binding to an electron pair is called a Lewis acid; conversely, any molecule that tends to donate an electron pair (to form a bond) is called a Lewis base. 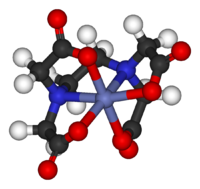 The first important man-made inorganic compound was ammonium nitrite for soil fertilization through the Haber process. Inorganic compounds are synthesized for use as catalysts such as vanadium(V) oxide and titanium(III) chloride, or as reagents in organic chemistry such as lithium aluminum hydride. Subdivisions of inorganic chemistry are organometallic chemistry, cluster chemistry, and bioinorganic chemistry. These fields are active areas research in inorganic chemistry, aimed toward new catalysts, superconductors, and therapies. Classical coordination compounds feature metals bound to "lone pairs" of electrons residing on the main group atoms of ligands such as H2O, NH3, Cl−, and CN−. In modern coordination, compounds almost all organic and inorganic compounds can be used as ligands. The "metal" usually is a metal from the groups 3-13, as well as the trans-lanthanides and trans-actinides, but from a certain perspective, all chemical compounds can be described as coordination complexes. Main group compounds have been known since the beginnings of chemistry, for example, elemental sulfur and the distillable white phosphorus. Experiments on oxygen, O2, by Lavoisier and Priestley not only identified an important diatomic gas, but opened the way for describing compounds and reactions according to stoichiometric ratios. The discovery of a practical synthesis of ammonia using iron catalysts by Carl Bosch and Fritz Haber in the early 1900s deeply impacted mankind, demonstrating the significance of inorganic chemical synthesis. Typical main group compounds are SiO2, SnCl4, and N2O. Many main group compounds can also be classed as “organometallic,” as they contain organic groups, for example, B(CH3)3). Main group compounds also occur in nature, for example, phosphate in DNA, and therefore may be classed as bioinorganic. Conversely, organic compounds lacking (many) hydrogen ligands can be classed as “inorganic,” such as the fullerenes, buckytubes and binary carbon oxides. Copper phthalocyanine is a transition metal compound related to haem. Transition metal compounds show a rich coordination chemistry, varying from tetrahedral for titanium (for example, TiCl4) to square planar for some nickel complexes to octahedral for coordination complexes of cobalt. A range of transition metals can be found in biologically important compounds, such as iron in hemoglobin. These compounds occur (by definition) in nature, but the subfield includes anthropogenic species, such as pollutants and drugs, for example, Cisplatin. The field includes many compounds, for example, the phosphates in DNA, but also metal complexes containing ligands that range from biological macromolecules, commonly peptides, to ill-defined species such as humic acid, and to water (for example, coordinated to gadolinium complexes employed for MRI). A central construct in inorganic chemistry is Group Theory. Group Theory provides the language to describe the shapes of molecules according to their "point group symmetry." Group Theory also enables factoring and simplification of theoretical calculations. As an instructional tool, Group Theory highlights commonalities and differences in the bonding otherwise disparate species, such as WF6 and Mo(CO)6 or CO2 and NO2. Because of the diverse range of elements and the correspondingly diverse properties of the resulting derivatives, inorganic chemistry is closely associated with many methods of analysis. Older methods tended to examine bulk properties such as the electrical conductivity of solutions, melting points, solubility, and acidity. With the advent of quantum theory and the corresponding expansion of electronic apparatus, new tools have been introduced to probe the electronic properties of inorganic molecules and solids. Often these measurements provide insights relevant to theoretical models. For example, measurements on the photoelectron spectrum of methane demonstrated that describing the bonding by the two-center, two-electron bonds predicted between the carbon and hydrogen using Valence Bond Theory is not appropriate for describing ionization processes in a simple way. Such insights led to the popularization of molecular orbital theory as fully delocalized orbitals are a more appropriate simple description of electron removal and electron excitation. Spectroscopy: Historically, UV-vis spectroscopy has been an important tool, since many inorganic compounds are strongly colored. Electron-spin resonance: ESR (or EPR) allows for the measurement of the environment of paramagnetic metal centra. NMR spectroscopy: Besides 1H and 13C many other "good" NMR nuclei (for example, 11B, 19F, 31P, and 195Pt) give important information on compound properties and structure. Also the NMR of paramagnetic species can result in important structural information. Inorganic synthetic methods can be classified roughly according the volatility or solubility of the component reactants. Soluble inorganic compounds are prepared using methods of organic synthesis. For metal-containing compounds that are reactive toward air, Schlenk line and glove box techniques are followed. Volatile compounds and gases are manipulated in “vacuum manifolds” consisting of glass piping interconnected through valves, the entirety of which can be evacuated to 0.001 mm Hg or less. Compounds are condensed using liquid nitrogen (b.p. 78K) or other cryogens. Solids are typically prepared using tube furnaces, the reactants and products being sealed in containers, often made of fused silica (amorphous SiO2) but sometimes more specialized materials such as welded Ta tubes or Pt “boats.” Products and reactants are transported between temperature zones to drive reactions. ↑ "Facts & Figures Of The Chemical Industry," Chemical and Engineering News July 10, 2006. ↑ J.M. Lehn, Supramolecular Chemistry: Concepts and Perspectives (VCH: Weinhiem, 1995). ↑ N.N. Greenwood & A. Earnshaw, Chemistry of the Elements, 2nd Ed (Oxford: Butterworth-Heinemann, 1999, ISBN 0-7506-3365-4). ↑ C. Elschenbroich, A. Salzer, Organometallics : A Concise Introduction 2nd Ed (Wiley-VCH: Weinheim, 1992, ISBN 3-527-28165-7). ↑ S. J. Lippard, J. M. Berg, Principles of Bioinorganic Chemistry (Mill Valley, CA: University Science Books, 1994, ISBN 0-935702-73-3). ↑ A.F. Wells, Structural Inorganic Chemistry (Oxford: Clarendon Press, 1984). ↑ F.A. Cotton, Chemical Applications of Group Theory (New York: John Wiley & Sons, 1990). ↑ R. G. Wilkins, Kinetics and Mechanism of Reactions of Transition Metal Complexes (Wiley-VCH Verlag, 1991, ISBN 3-527-28389-7). ↑ G.S. Girolami, T.B. Rauchfuss, and R.J. Angelici, Synthesis and Technique in Inorganic Chemistry (Mill Valley, CA: University Science Books, 1999). Cotton, F. Albert, and Geoffrey Wilkinson. 1980. Advanced Inorganic Chemistry, 4th ed. New York, NY: Wiley. ISBN 0-471-02775-8. Greenwood, N.N., and A. Earnshaw. 1998. Chemistry of the Elements, 2nd ed. Oxford, U.K.; Burlington, MA: Butterworth-Heinemann, Elsevier Science. ISBN 0750633654. Moore, John W., Conrad L. Stanitski, and Peter C. Jurs. 2005. Chemistry: The Molecular Science, 2nd ed. Belmont, CA: Thompson Brooks/Cole. ISBN 9780534422011. This page was last modified on 6 November 2008, at 16:54.